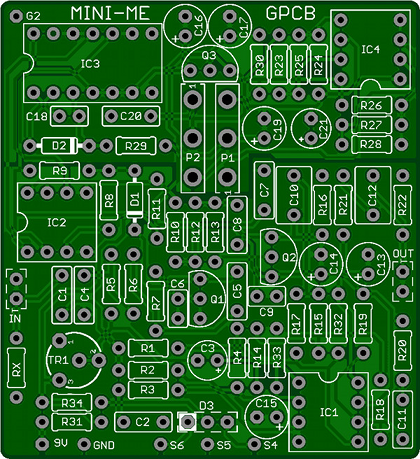 This kit includes all of the parts needed to build the GuitarPCB Mini-Me chorus project. The Mini-Me is a modified Small Clone™ by ElectroHarmonix®. The depth switch has been replaced with a knob to provide more control and flexibility in comparison to the original. This audio path is completely analog in this circuit, using the MN3007 bucket brigade integrated circuit. The circuit board features PCB-mounted potentiometers, reducing wiring burden. This kit comes with a 125B enclosure and Davies 1510-style knobs. Small Clone™ is a trademark of ElectroHarmonix®. Pedal Parts and Kits is not associated with and makes no claims to these trademarks. See our FAQ for more details. 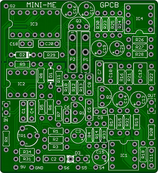 Check out this video demo by Barry at GuitarPCB!